Is it just me, or is strawberry season far too short? It’s an especially short season for locally-grown strawberries in Austin. We’ve been getting pints of them in our CSA from Farmhouse Delivery, and I’ve been buying them at farmers’ markets. Just yesterday, when I bought some at Boggy Creek Farm, I worried they might be the last of the local season. Yes, I worry over strawberries. I worry over homegrown lemons too and how to best use them, and that could be why I decided to combine the two in a dessert. This fruit salad is from Barefoot Contessa Back to Basics , and the recipe is also available online. 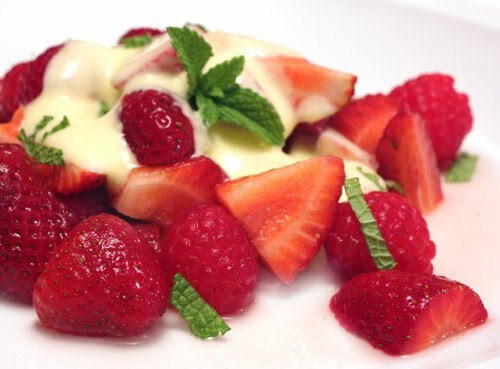 Fresh berries were mixed with limoncello and topped with a yogurt sauce made with lemon curd. The recipe actually suggests using purchased lemon curd, but I had a last bit of frozen meyer lemon juice, so I made my own lemon curd. I also still had some of the limoncello I made earlier in the year. The lemon curd was whisked into some Greek yogurt along with honey and vanilla. For the salad, I used only strawberries and raspberries rather than the recommended mix of berries and bananas. The berries were tossed with a pinch of sugar and a few tablespoons of limoncello and allowed to sit at room temperature for five minutes or so. The macerated fruit was topped with the yogurt sauce and chopped mint. I don’t think I’d ever tried limoncello with strawberries before, but it’s a combination that’s very worth remembering. In fact, I see a cocktail created with strawberry juice and limoncello in my future. And, the lemony, tangy yogurt sauce made the dessert more special than you would expect a fruit salad to be. I may not have much time left to repeat this dessert with local strawberries this year, but I might try it again when blackberries make an appearance. 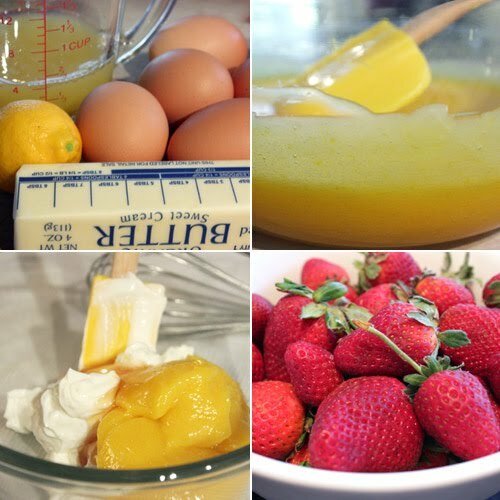 OMG lemon curd and Greek yogurt...a match made in heaven...and then strawberries...this is an incredible dessert! using a little lemoncello is a wonderful touch! I think it's time for a little fruit salad dessert. I need to buy some a bunch of strawberries. Come to Califorina! Our strawberries are year round!! This is a wonderful way to enjoy the bounty. Mmmm.. Our strawberry season hasn't even started yet. So, I have this to look forward to! This sounds like an outrageously delicious combo! That combination just sounds so delicious and refreshing - I have to say, limoncello goes well with about anything. This dessert has my name on it. Love anything with lemon in it!! We are still weeks (months?) away from strawberry season in Seattle. Hell, asparagus hasn't even made an appearance yet. But, I have to say that once they show their beautiful faces (in June), they are quick to leave. This is a terrific way to highlight their delicate and oh-so-delicious flavor. Strawberry season is definitely far too short!! I would love to try this recipe if the season starts here. What a delightful summer fruit dessert! What a lovely summer desert! I love strwwberry!! !thanks for the recipe! you're definitely not the only one bemoaning the short strawberry season! this is a lovely treat, lisa. i think bananas would foul it up entirely, so i'm glad you left them out! I make this for Christmas morning brunch! Everyone adores it. And I leave the bananas in. I blogged about it last year. I LOVE Ina!! Oooh fabulous, Lisa! We have the best Brittany strawberries now on the stands and this is perfect! Love making lemon curd and I just happen to have a bottle of Limoncello. Beautiful! Will make a flavorful and elegant dessert I must say! Strawberry and raspberry season is just beginning to kick off here in Minnesota (yay!) but until they're ready, I've had to buy mine at the grocery. This is the picture of a perfect summer dessert - vivid in color, bright in flavor! My favorite yogurt sauce over summer berries. Simply delicious! I do a fruit salad with limoncello mascarpone. This is so similar and even healthier, so I know I'd love it. Well, if there is limoncello, then it must be had. 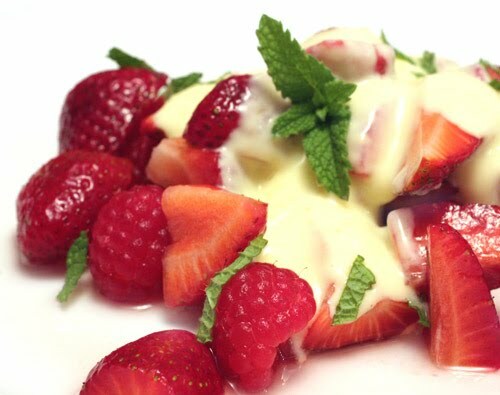 Limoncello and yogurt sauce sounds wonderful with berries! Loving the gorgeous colors of those berries...what a perfect dessert for the hot summer days! I've had a bottle of limoncello in the refrigerator for a year! This is a great excuse to use it. I'll test it first ;). I don't suppose it goes bad. That sauce sounds gorgeous! Very creative! I still have some home made limoncello left to make this tasty salad! Thanks!! looks so elegant & stylish too, Lisa!